Julie Goodnight takes on topics you want to know more about in her online training library—part of her ever-expanding Horse Master Academy (http://signin.juliegoodnight.com) now with a free access membership to help you search for many training articles, videos and MP3s! ​Julie Goodnight is an internationally respected trainer and clinician with experience in many types of training. She grew up riding ponies and horses on an Orlando farm and competed in hunter jumpers throughout her youth. Julie counts horses among her earliest friends; she spent many summer days hanging out in the horse pasture and studying how the horses moved and interacted. During her college days in New Mexico, Julie earned extra money by warming up Thoroughbreds on the race track. The cowgirl felt at home in the west and soon hit the trails and studying Western disciplines. Always the adventurer, she began leading riders through the Rocky Mountains. As a natural teacher, Julie decided to make horses her life’s work-and to teach people how to work with horses safely and with kindness. Showing her dedication to teaching and safety, Julie earned her Master Instructor and Clinician ranking with the Certified Horsemanship Association (the association she continues to represent as International Spokesperson). In 2008 she was named Equine Affaire’s Exceptional Equestrian Educator–one of only three awards ever given. Now, Julie teaches riders how to be their horse’s leader and to excel in whichever equestrian sport they choose. Her varied background and training in dressage, jumping, racing, reining, colt-starting, cutting, and wilderness riding make her a well rounded instructor. 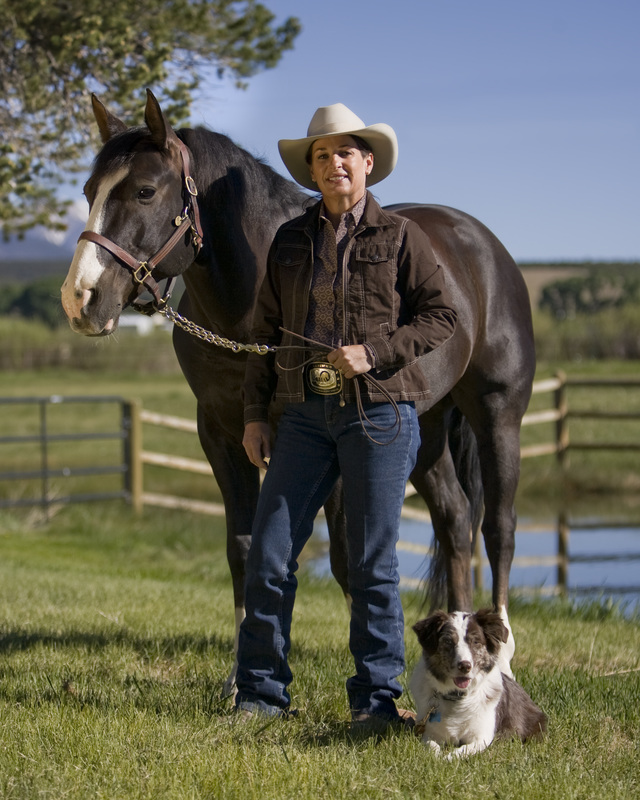 She teaches horse owners around the world how to establish great relationships with their horses through her Clinic Tour, Horse Master with Julie Goodnight television show, Expo Appearances and her many How-To DVDs. Julie is now best known for her award-winning television show airing weekly on RFD-TV--Horse Master with Julie Goodnight. Through the show, Julie hopes to help all riders master their equestrian dreams and skills. As “The Horse Master,” Julie shares the wisdom she’s gained by reaching her master-level CHA status and encourages all horse people to become the leaders/masters their horses want and deserve. Natural horsemanship is founded on understanding horse behavior and the idea that horses look for leadership, direction and assurance that they’re safe and acting appropriately. Julie strives to teach you how to master that ideal and emphasizes the importance of life-long learning. ​If you keep your horses at home, you’ve probably already developed a routine that makes your job efficient and keeps the horses happy. But if you are new to this, or are looking for helpful hints to make your horse life easier, I’d like to share with you the ‘tricks of the trade’ that I have learned over the decades. Feed time can be very stressful for the horses, especially when they are only fed twice a day. Nothing could be more unnatural to the horse, since he is designed to eat small amounts all day long. 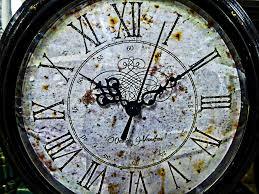 His digestive system is designed to always be full, so when he is fed two lump-sum meals that he finished within an hour or two, his stomach gets empty and he now has 6-8 hours or more to worry about when his next meal is coming. In addition to digestive and emotional stress, horses may also learn to act aggressively or rudely, which is reinforced as soon as you feed them. So it’s important to do what we can to alleviate the stress, by developing a good feed-time routine. My horses have free-choice access, 24/7, to a low-protein grass hay (tested at 9% protein). When your horses have free-choice hay (only grass hay and never alfalfa), it removes almost all the feed-time stress; there is little to no fighting over food; horses that previously would chase other horses off and hoard the food will eat side by side with their herd mates. I often look out in the paddock and see all of our horses eating from the same pile, with their noses virtually touching. Because horses know they can eat whenever they want and never worry about having enough food, they take turns at the feeders and they never gorge themselves. Free choice access to grass hay brings a lot of peace and tranquility to the herd, helps keep mental stress low and is critical to digestive health. I find that we have much fewer problems with colic and ulcers with the horses on free-choice and we have no problems at all with obesity. If you are not in a situation where you can give them free-choice hay, you should feed hay in sufficient quantities that he always has a little bit left over before the next meal comes or feed more often than twice a day. If the hay you feed it too high in protein or so sweet that your horse may over eat, try using a slow feeder, such as the Savvy Feeder, that will slow your horse down and help him savor the hay all day long. Horses love to know what is coming next and they love routines. It makes them feel safe. Develop your feeding routine in such a way that the horses can anticipate it and so that they will help you get the job done. Everyone’s situation is different and there are many ways to make it more efficient, but I will tell you our routine and why it works. Half our horses stay outside in the paddock all day and all night, while the other half (our performance horses) are out all day and come into stalls at night. We do this for several reasons. One is that our performance horses frequently travel and have to stay in stalls when they do, so we want them accustomed to and comfortable with that confinement. Also, in addition to their free-choice hay, each horse gets special supplements and some get medications, so separating them makes it easier to feed a customized diet. All our horses receive daily doses of Cosequin (a joint health supplement), Wellactin (an omega 3 fish oil for their coats, immune systems and cardiovascular health) and Calxequin (an all-around vitamin supplement). Additionally, some of our horses get Proviable daily (a high-quality pre- and pro-biotic for digestive health) and occasionally one or more of our horses are also receiving some medication in their feed. Each morning at the same time every day, the horses are all given a token amount of grain to carry their supplements. Most horses do not need any grain if they are receiving adequate amounts of hay. Hay or grass forage are considered “roughage,” while grains and complete feeds are considered “concentrates.” I personally like to avoid concentrates as much as I can but to get the horses to eat the supplements, we give them just a handful of whole oats (no additives or processed feeds). While they are eating their grain, we are taking off blankets and opening the alleyway to the paddock so that when they are finished, we can just open the stall door and let them trot out to the paddock by themselves. They will all spend the day out there together, munching contentedly when they want, napping in the sun and playing together. Once the horses are all out, we clean the stalls, wash and fill the water buckets, load up the hay in each stall (so the stalled horses have all the hay they want at night) and prep the night-time grain and supplements (but leave it in the feed room so it doesn’t get eaten by the dogs). By 10 o’clock each morning all the chores are done for the whole day and the only remaining feed-time chore is to open the gates and let the horses in. At 4 o’clock each afternoon, we place their previously prepared grain/supplements in the stall (I always feed hay and grain from the ground level, which is more natural and healthier for their respiratory systems, than putting it in a raised feeder). We close the barn doors to the outside, open all the stall doors, then open the gate to the paddock to let the horses in. Because we use the same routine at the same time every day, the horses are lined up to come in and they march right into their stalls. 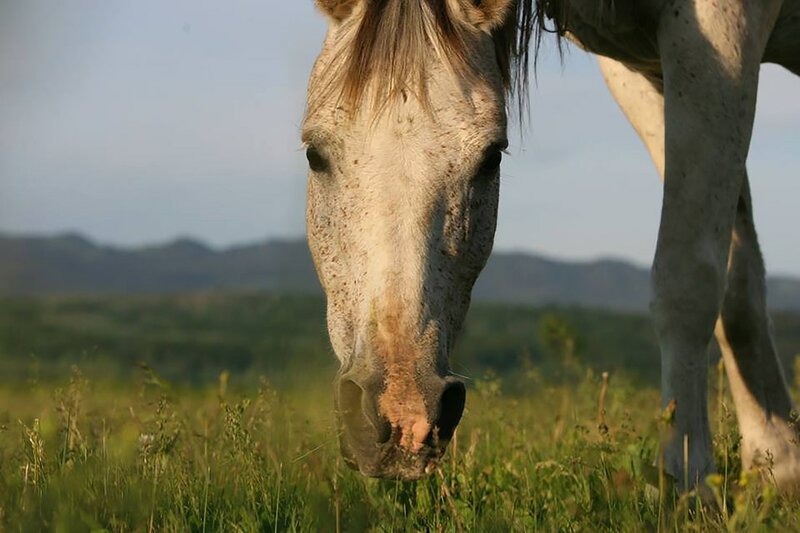 A horse has very simple needs when it comes to nutrition—they need roughage (10-20 pounds a day), water (10-15 gallons a day) and free-choice salt. I keep a Redmond all-natural sea salt lick in each stall and I keep several “rocks on a rope” in the paddocks, near the waterers. We also hang two water buckets (heated) in each stall and one of them has “Rein Water” mixed in—it’s a mineral mixture that horses love. It not only encourages them drink more, but it also helps the water taste familiar when we are on the road. I prefer to have buckets in the stalls and not automatic waterers so that I know exactly how much water each horse consumed overnight. ​Train Your Horses to Help. I’ve taught my horses to come in the barn when I call them. It’s easy to do. Just use a unique call or whistle every day before they come in for feed. To get started, you may have to shake a grain can after your call and let them have a taste as soon as they come. Soon, the call or whistle itself will get them in. Use it every day so it is like a dinner bell. Then, even if I need to bring them in early, my call will always get their attention. If one horse learns it, the rest will likely follow and teach the new horses what it means. If you let your horses march themselves into the barn and stalls, do it in the same order everyday so they know what to expect. Soon they will be lining up in order and not vying for position. The more consistent your routine is, the better the horses will respond. Make sure your horses do not act aggressively or display dominance when you feed them. If you must walk into a pen with feed, use a flag to make sure all the horses stay back and do not try to grab feed out of your arms—this is dominant behavior and very dangerous. If a horse is inside a pen or stall and you do not have to go in to feed, he should still be patient and polite. If he is acting aggressively or rudely, do not feed him in that moment. Use a flag to back him up and wait until his ears are forward before you throw the feed in. If you feed him while he is acting poorly, it reinforces that behavior and turns it into an engrained habit. Keep in mind that horses establish dominance in the herd, in part, by taking away food from others. If the horse ever comes to believe that his aggressive antics are causing you to feed him, then in his mind, every day you are proving to him he is dominant. Make sure your horses are acting appropriately in the moment that you feed them to help avoid dominance issues. Whatever your horse-keeping situation is, there are probably things you can do to make it more time-efficient, easier and less stressful for your horses. Keeping a routine that is strictly adhered to by everyone that does the feeding chores, will help train your horses so that they cooperate in the process instead of interfere. Join Goodnight at her two-day clinics and get personal attention to help you succeed with your own riding goals. All disciplines and riding levels welcome. Goodnight helps you attain your personal goals and meets you and your horse where you are, to help you move forward. Goodnight is proud to recommend Myler Bits, Nutramax Laboratories, Circle Y Saddles, Redmond Equine, Spalding Fly Predators, Bucas Blankets and Millcreek Manure Spreaders. Goodnight is the spokesperson for the Certified Horsemanship Association. Explore her online library and many training videos at http://tv.juliegoodnight.com; be sure to sign up for the free monthly training news at http://juliegoodnight.com and please subscribe to the free Youtube channel at http://youtube.com/juliegoodnight.